Gives every young rider with an eye for fashion and a passion for fun, a set of wheels that is sure to be the hottest accessory in town! 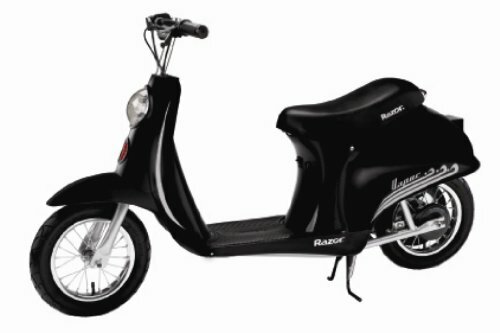 Vintage-inspired styling meets high performance with the classic Italian scooter design. Features and Specifications Hand-operated rear brake. Retractable centre mount kickstand. Scaled down classic scooter design carries riders up to 77kg. Battery charge time: 12 hours . Large 12” pneumatic tyres for a smooth ride. High-torque motor with chain drive. User's Manual Click here to download a free user's manual Learn how to assemble the Pocket Mod with this quick tutorial Safety Instructions Some assembly is required for this product Max Rider Weight: 77kg Recommended Age: 13 years + Safety Warnings Note: Vehicle not to be used on public highways (roads/pavements), vehicle must be used on private property with owners consent, appropriate protective equipment to be worn at all times, children must be supervised by an adult at all times.